The Wife and I stopped by El Pacifico tonight. Fortunately, they have outdoor seating, which was a godsend as the interior had the nose-hair curling antiseptic stench one encounters too frequently in Mexican restaurants. The menu was large and largely uninteresting, so I decided to get a classic dish that I can’t remember ordering in the past 20 years: nachos. 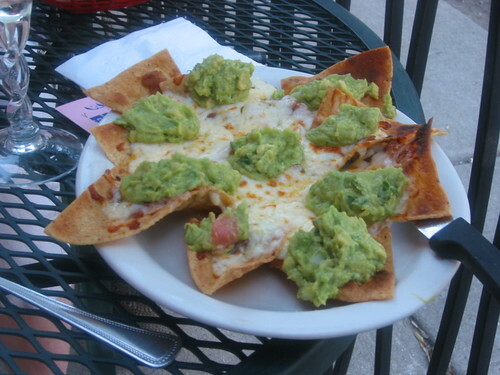 They were inoffensive, with better cheese than I expected and blobs of decent guac but overall my palate was flat-lining. We had a series of abominable dishes – including a fish tostada that was unbelievably bad, vile to the point of being inedible, and a chile relleno that was fried to blackness. Then the meatballs arrived. 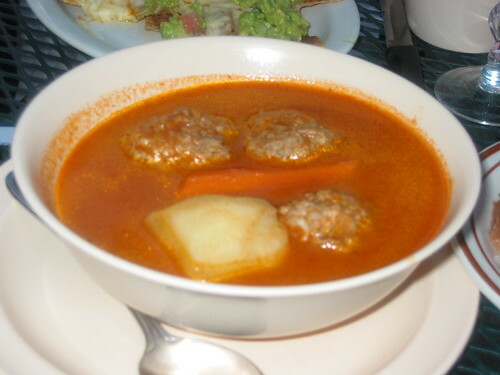 Now, I’m not sure I’ve ever ordered abondigas in a Mexican restaurant, but these were pretty good, seasoned slightly, in a warm tomato broth. These were actually “porcupine meatballs,” beef flecked with rice, and The Wife enjoyed them quite a bit – just like Mom used to make, she observed. Casa del Pueblo offers meatballs that are pretty good. A classic way to serve these is with a hunk of hard-boiled egg in the center of the ball and mint in the meat-mix. I'm not too embarrassed to admit that I've found myself in this exact state on more than one occasion. I usually head to White Castle, which I imagine provides the same morning-after effects as would that rancid fish. Kennyz wrote: I'm not too embarrassed to admit that I've found myself in this exact state on more than one occasion. I usually head to White Castle, which I imagine provides the same morning-after effects as would that rancid fish. I don't believe Mr. Hammond said the fish was rancid, which would be a health code violation and should be reported to the appropriate City of Chicago dept. There is a Grand Canyon size gulf between tastes "vile", as in horrid flavor, and rancid fish. I was being careful about wording here, and I will say that my daughter, The Wife and I all ate the fish and found it bad though we could not agree if it had, indeed, turned. None of us became ill, I'm pleased to report, so I'm going to conclude it was just lousy stuff. David Hammond wrote: I was being careful about wording here, and I will say that my daughter, The Wife and I all ate the fish and found it bad though we could not agree if it had, indeed, turned. None of us became ill, I'm pleased to report, so I'm going to conclude it was just lousy stuff. If fish had turned LTHForum would not be the appropriate venue, you should contact the proper City of Chicago Dept. Some types of posts have legal implications for you and the site. Please refrain from accusations of criminal activity, health code violations, or other wrongdoing. If your complaint is serious and provable, please take it to the proper authorities. Further, we find reports of restaurant and purveyor violations or closures, regardless of the circumstances, to be an area ripe for competitor abuse. We will remove these posts unless substantiated with a published source, e.g. a link to a quality published account. Thanks for the posting guidelines. The word rancid is an adjective used to describe an unpleasant smell or taste that may or may not be a result of decomposed foods. One could describe the smell of a perfectly fresh durian as rancid and be using the word properly. David Hammond wrote: Yes, I know.